Medical professionals are responsible for providing care to the patients who come to them seeking treatment for their sicknesses, ailments, and injuries. Patients entrust doctors and nurses with their health and healing, so it is vital that medical professionals stay vigilant in their efforts and prepared for the diverse needs of their patients. To be properly prepared for the treatment of various injuries and wounds, medical professionals should make a habit of keeping wound care supplies adequately stocked and accessible, so they can treat their patients thoroughly and efficiently. Here are the 12 wound care supplies that every medical professional should always have on hand to use as they care for patients’ injuries. Non-woven sponges are comprised of tightly pressed, polyester and/or rayon fibers. These sponges are thicker and more durable than woven sponges, which makes them ideal for scrubbing and protecting wounds. Non-woven sponges leave minimal lint in a wound when they’re removed, making them a great option for packing open wounds and promoting optimal healing. Alcohol pads, sealed and packaged individually, are used to clean and prepare the skin for an injection or incision. Many wounds may require the patient to receive a shot or undergo a surgical procedure involving an incision. Alcohol pads help prevent bacteria from entering the body when the skin is pierced or lacerated. Disposable face masks, which secure easily and comfortably over the ears, are effective for protecting both the patient and their medical care professional. These masks provide a barrier against airborne pathogens and bacteria that could infect and further complicate the degree of a patient’s wound. Masks also help keep medical providers healthy, and minimize the spread of contagious illnesses in a practice. Many types of wounds may be closed by sutures, which need to be removed once the wound has closed and healed. Suture kits contain pre-packaged, sterile tools such as metal littauer scissors, forceps, and gauze needed to remove sutures safely. These kits are convenient, sterile, and help prevent inadvertent introduction of bacteria to a healing wound. Much like face masks, medical gloves help protect medical care professionals and their patients. 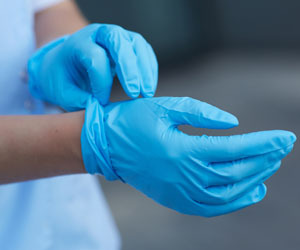 Wearing gloves while treating an injured patient will prevent any transmission of bacteria to their wound, as well as protect the medical professional from any infections or viruses that may be present in the blood or body fluids of the patient. Medical practices should keep a constant supply of both latex, and latex-free gloves in stock for the continued health and safety of themselves and their patients. Medical gauze rolls are used frequently as the first layer of dressing and bandaging of a wound. The bleached, loosely woven can be used to absorb moisture or wick away fluids that will be absorbed in an outer bandage on the wound. There are different gauges of gauze, and medical professionals typically keep a variety stocked and available to best treat and dress the wounds they may encounter. Cotton tipped applicators have a wide array of uses in a professional medical environment. They can be used to clean the wound, as well skin surrounding it. They are also useful for gently swabbing a wound to obtain a sample for further testing that might be required to determine the presence of an infection. Cotton tipped applicators are useful in applying medicines or ointment to wounds as well. In the event a patient is suffering from a wound that requires surgical closure, medical drapes should be available for medical care professionals to use as a safeguard against infection. Drapes are disposable and impermeable, so they help isolate the injured area, and prevent bacteria from migrating into the wound during surgery. Cotton balls are frequently used for cleaning, sanitizing, and prepping wound sites before bandages or dressings are applied. They can also be used as a sterile method to apply medicines or ointments to a wound to ensure it stays clean and free of bacteria. Wound care supplies are designed to protect patients and help them heal as quickly as possible after they’ve sustained an injury or undergone surgery. Accessible and adequate quantities of all the supplies needed for a vast range of wound types and scenarios undoubtedly set medical professionals up for successful wound treatment.